After work, Wizard and I went for a ride in the Assunpink for about an hour. I focused on “equitating” during the ride, keeping contact instead of dropping it, and being more aware of my seat and hands. We did little trot sets for a few minutes at a time, and even got brave and walked through the edge of the Horse Park again. Wizard was a little looky, but behaved throughout the ride. When we returned, I rode him in the arena for about 20 minutes, doing a little canter work and working on our bending exercises in preparation for Friday’s lesson. The slow turn from spring to summer seems to be starting here in New Jersey. The grass in the fields is springing up, and the TICKS are out in full force. Baby rabbits are everywhere, and the twilight lasts just a bit longer each day. Before work, Wizard and I had a lesson with Lisa. I had him warmed up at a marching walk when Lisa arrived, and we picked up contact and began our work. All my homework of bending my elbows and sitting in the saddle instead of hovering seemed to help, because Lisa did not have to remind me about either of them much during the lesson. We started out where we left off in our first lesson on about half the ring, establishing a rhythm in the trot and asking for softness with the inside rein while keeping the outside rein steady for him. Once we got some moments of good bend and contact, we opened up the trot work to the entire arena a few times, keeping our 20-meter bend around the entire ring, followed by walk-trot transitions. When we transitioned to a walk, Lisa was clear that we should go “forward into a walk,” in order not to fall into that bad habit of sort of slumping from a working trot into a lazy walk. We also worked on the walk-to-trot transitions, oozing up into a trot instead of jolting out of balance. We did a few smaller circles at a trot in each direction, transitioning to a walk when we reached the rail at the end of the circle. The transitions got Wizard engaging his hind end more, and took him a little off his forehand. 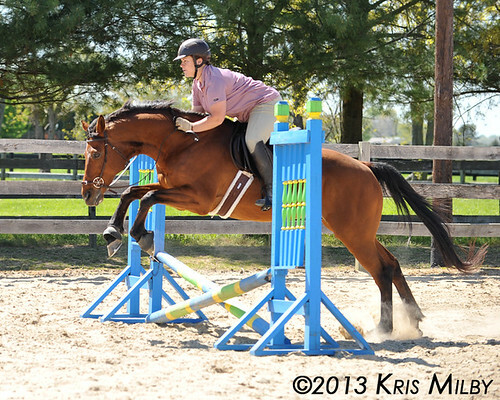 In the beginning of the ride, he tripped once or twice, but I felt nothing clumsy for the second half of the lesson as he got more supple and balanced. When our trot work was looking good, Lisa asked us to do a canter transition. We did the left lead first, and it was not pretty. All the nice bend and engagement that we had at the trot flew out the window. Wizard reverted to his nervous habit of curling behind the bit and slinging his neck downward. I sat up, continued my conversation with my inside rein while using my inside leg to get him back into some sort of bend. Lisa was more interested in the transitions, and not as much in cantering around the arena a zillion times. We picked up the right lead on the second attempt, and although it was less pretty than the left lead, I had a plan, and was able to keep him together a little better. When we transitioned to the trot, Lisa had us do a circle at the trot. All the little pieces and patterns helped both me and Wizard. We were not just floundering around the ring aimlessly. We had transitions to keep us balanced, circles to keep the shape, and the tools to work on this cantering stuff. We ended the lesson with trot work, trying to get Wizard to open up his throatlatch and soften his trot, like he did in the beginning of the lesson. Often times, it’s tempting for a rider to end with the “exciting” stuff, like cantering or jumping, but it’s helpful for a horse like Wizard to have a cooldown period to get back into the happy trot work and then cool down from the ride. He wanted to ride behind the bit, but I used my leg to push him up and forward, and gave a little flick of the outside rein when he slung his neck down. Stretching into the bit is good, but when he slings his neck down or swings his haunches to the inside, he pushes through the aids. It took a few minutes, but he softened and we ended the lesson with a nice trot. Our homework: Work on the transitions at all gaits. At the trot, go “forward into a walk” for four steps, and ooze back up into a trot. Use the circles to work on bending. Keep tackling the canter work in small pieces as movements and components, like a dressage test. Do the excellent exercise of a leg yield at a trot and transition into a canter when we reach the rail (great way to get the horse on the inside leg and outside rein). Incorporate jump and pole work into our rides. Trot a cross rail, and then leg yield after the jump. Don’t let him get into the mode of ’round and ’round the arena. Use the exercises to keep Wizard keen and balanced. Work toward being light and lifting the withers. In the words of the great Walter Zettl, ride up into heaven, not down into hell. So I have been working with a green horse that I am getting back into shape after a couple years off (rescue horse). He has had some professional training at some point in his life as he carries himself decently for being out of shape. However whenever I do a downward transition he lifts his head sky high and stops. How can I stop this? I know it will take time, but what are some steps to encourage him to stay low and halt? He has absolutely no muscle, or at least very little, so I’m really only focusing on the halt-walk transitions. Specially since when I work on walk-trot halt-trot ones he gets up and starts racing around the ring. Any ideas help! Thanks!